From 2011 to 2015 U.S. National Health Expenditures are projected to have grown by $538 billion. Hospital and nursing home care will account for 37 percent of this growth, while physicians and other health professionals will account for 24 percent. Prescription drugs will account for 12 percent, as will the net cost of private insurance. An analysis of U.S. National Health Expenditures clearly reveals that prescription drugs are not and will not be the primary driver of health care spending growth. 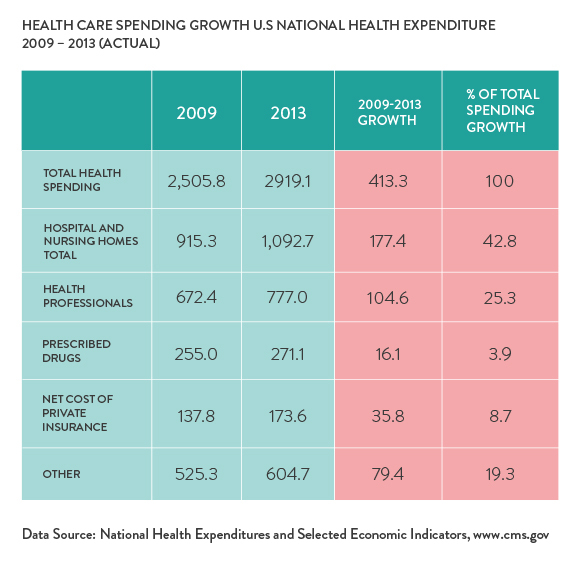 In fact, in the most recent 5-year period for which actual spending data is available, prescription drugs accounted for less than 4 percent of the $413 billion national health expenditure increase from 2009 to 2013. In contrast, hospitals and other institutional care, accounted for 43 percent of spending growth during this period. Physicians and other health professionals accounted for 25 percent of the growth. See table below. Surprisingly, from 2009 to 2013 the net cost of private insurance (the difference between premiums charged and benefits provided) accounted for 9 percent of health spending growth, more than double the contribution of prescription drugs. Major scientific advances in new medicines to treat cancers and other life-threatening disease will, in future years, have a larger impact on overall health spending increases. But national health expenditure projections show that prescription drugs will still not be the primary driver of health spending increases. 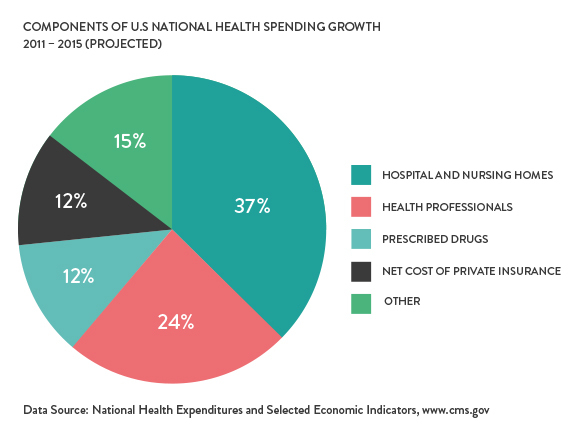 In fact, the projections for spending growth from 2011 to 2015, which include the impacts of the more recent availability of new specialty drug treatments, show that the contribution of prescription drugs to overall health spending growth will be 12 percent. This is still far less of an impact on health spending growth than that by physicians and other clinicians and hospital and other institutions. See chart below.